Versace is one of the most prominent labels in the fashion industry. This Saturday on November 19, its collaborative collection with retail giant H&M will finally be available in the US (and it'll without a doubt be a spectacle—people plan to line up for hours). 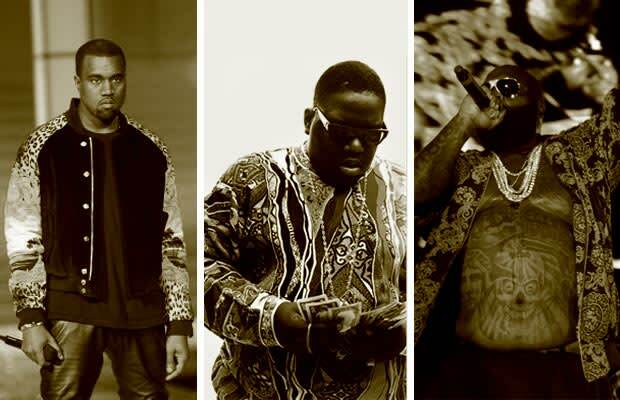 Interestingly, we've noticed that rappers have been rocking Versace more often, too. In the last year or so, Drake, Rick Ross, and Big Sean have all been seen in the brand. Versace back! Of course, we couldn't help but flashback to the days of Versace throughout the 30-something years of hip-hop. The Italian fashion house has played an important role in the history of the rap game. Founded in 1978 by the late Gianni Versace, the label's bold, baroque-style prints represented a flashy lifestyle. It was championed by rap stars like Notorious B.I.G. and Lil Kim in New York. It didn't take long, though, before other artists followed suit, assuring Versace's legacy in the rap community. The label has been quiet for a few years, but it looks like Versace will take retail and rap by storm yet again. After all, way before Kanye West and Jay-Z schooled us on brands like Givenchy and Balmain, Versace was that good good. So reminisce with us as we hit you with A History of Versace in Hip-Hop.